We’re pleased to announce that our One Book, One Mesa County 2015 selection is Can’t We Talk About Something More Pleasant? by famed author, illustrator and New Yorker cartoonist Roz Chast. In this illustrated memoir, Chast tackles both a personal and universal experience—caring for aging and dying parents—with yes, wit and humor, but also with sincerity and honesty. Using text, her signature style cartoons and other artwork, Chast creates a layered and true portrait of her parents’ last years. You can request library copies now. Our One Book programs will kick off on Thursday, January 22, 2015, and will include panel presentations, book discussions, movie showings, children’s programs, and more. 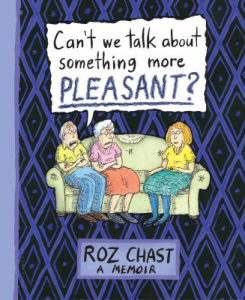 Roz Chast will present on Saturday, February 21at the Avalon Theatre. Program details will be available shortly. You’ll find all you need about our One Book event at http://guides.mesacountylibraries.org/onebook. We’re looking forward to your participation in our One Book 2015 events!